Looking for a big Bowie that ain't made like a toy? This 19" beast is wider than a cowboys hat, bigger than Dave’s dog, and is just a darn right monster! Its not hard to see where this classic western style bowie knife gets its name. Comes in either a 5mm wide damascus blade, or a 6mm D2 steel blade for extra heavy duty. 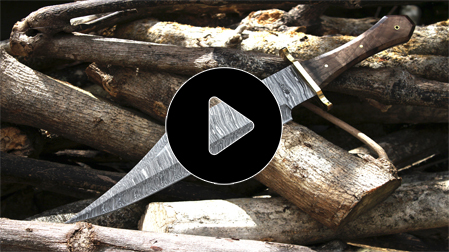 See Coffin Hilt Bowie - D2 Steel for our alternate version.